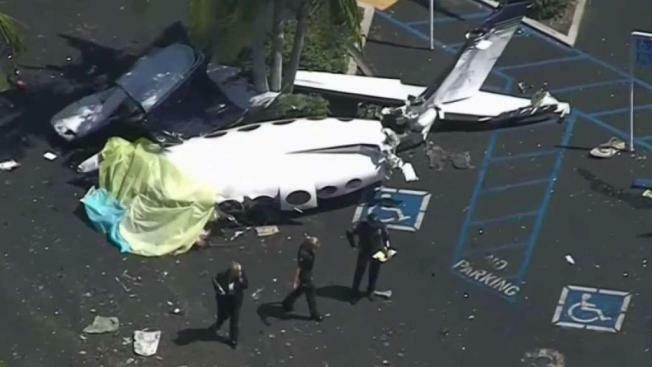 The Orange County coroner has released the names of the five people killed when a twin-engine aircraft crashed in a Santa Ana parking lot. One of the victims was identified Sunday by her family as 29-year-old Nasim Ghanadan, a Bay Area Realtor. The others were Scott Shepherd, 53; Lara Shepherd, 42; and Floria Hakami, 62 -- all from the Bay Area -- and 32-year-old Navid Hakami of Los Angeles. Investigators from the National Transportation Safety Board arrived at the crash scene Sunday night and left about two hours later to await daylight. Santa Ana police officers guarded the cordoned-off crash scene. No one was hurt on the ground as the twin-engine Cessna 414 aircraft clipped an unoccupied car, Orange County Fire Authority Capt. Tony Bommarito said at a news conference Sunday afternoon. 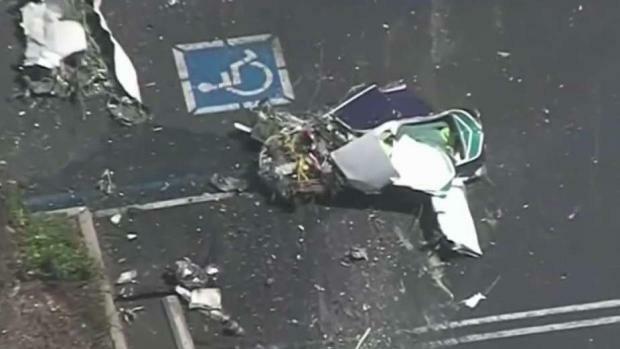 At least four of the people killed when a plane crashed in a shopping center parking lot are from the San Francisco Bay area. Toni Guinyard reports for Today in LA on Monday Aug. 6, 2018. The plane went down at about 12:30 p.m. Sunday into the parking lot of a shopping area in the 3800 block of South Bristol Street, about a mile northwest from John Wayne Orange County Airport, where the aircraft was headed. "As soon as they changed direction, I saw the nose of the plane go straight down to the ground," said witness Hiro Yamanouchi. The nearby intersection of Sunflower Avenue at Bristol Street was closed in all four directions as National Transportation Safety Board and Federal Aviation Administration investigators planned to comb the crash site. The 1973 Cessna was registered to San Francisco-based Category III Aviation Corp., FAA records show. It had been flown from the Bay Area suburb of Concord, FAA data revealed. Cessna 414 planes began operations in 1968. They have a range of 1,528 miles and a top speed of 270 miles per hour. The plane was running on 100 octane gas, which spilled during the crash, OCFA Capt. Steve Concialdi said. Fire crews remained on the scene to clean up the spilled fuel. "I don't know anything about what this pilot did, or what he was thinking, but it could have been much more tragic," Bommarito said. "This was a Sunday afternoon and we have people shopping, so the fact that we have no injuries on the ground is a miracle in itself." OCFA firefighters and coroner's personnel removed all the bodies from the wreckage by Sunday evening.